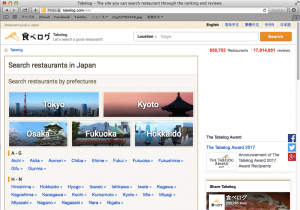 In the view of number of dealing restaurants, Tabelog is apparently the most largest gourmet site in Japan. They focus on collecting reviews, but also provides coupons and reservation features for the users. Another good fact is that the multi language site looks like showing very same number of restaurants as the original Japanese site. It is indeed unlike other major gourmet web sites. Still, it is not perfect for you to browse the contents. Reviews are all in original Japanese text as reviewers wrote so. Let me guide you here how you can get to read the reviews. Conditions on using this guide: Please be noted, from here below is guiding and showing based on Tabelog PC site. Each full sized pictures averagely around 1MB, some of them reach 2MB or above. The guide is totally relying on the Tabelog.com it self and google web translator, any trouble occurred by incorrect translation or whatever is not my responsibility. Open the original site of Tabelog. 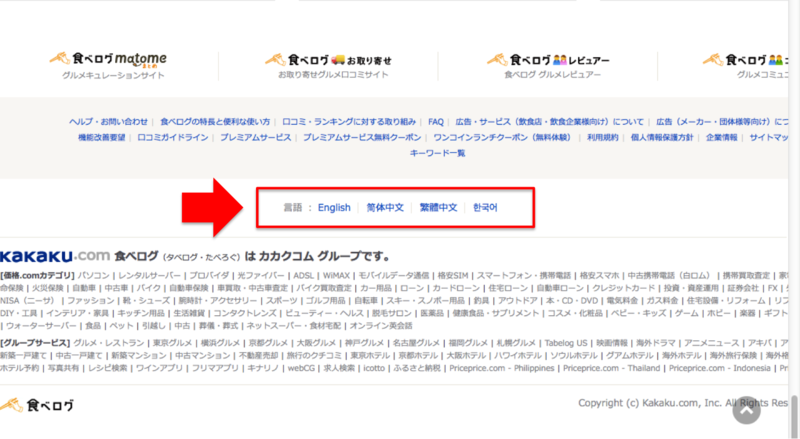 Scroll down and you’ll find select languages from English, Chinese or Korean in near bottom. Hooray! 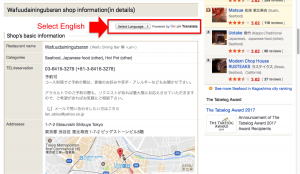 now you can seek your favourite restaurant in English. Seek by region, type&purpose or some kind of ranking, etc. Those features are almost same as Japanese original page. Good. Wafuudainingubaran, let me take this restaurant as an example. The original name is Wafu Dining Bar -Lan-. You see the English converted name is Roma Ji writing for us Japanese, but it does not make good sense for you but alphabet brah brah. I hope it doesn’t get you confused. Any way, go scrolling down to find shop details. Here, it looks the details information is still in Japanese. No worry, even though only English is available, you can change the language by google translate at right above the shops basic information. Go back to the top of this page. You can see tabs for Top, Photo Gallery and Review. Photos provide you vivid images of the restaurant. Review is very helpful for you to find a right place to dine in. BUT, again, the reviews are in Japanese original text here. 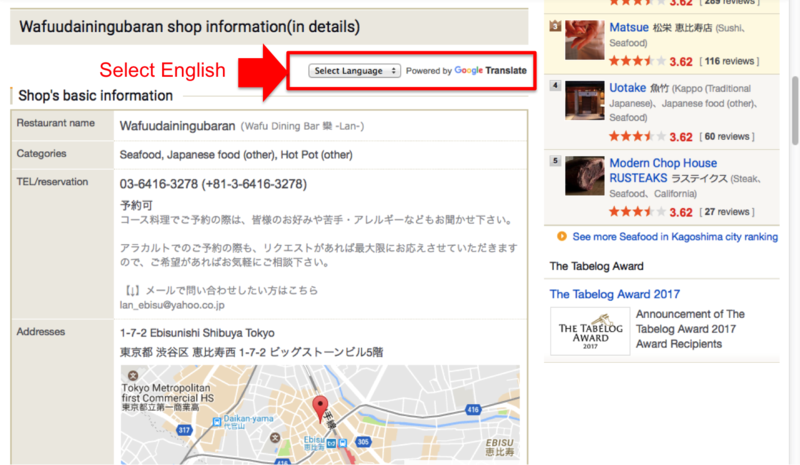 Now you need to use the web tool, Google Translate Web – iTools. 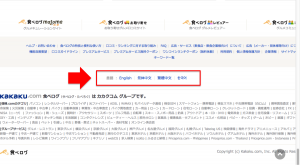 Copy the URL from the review page and paste it in the Google Translate Web. 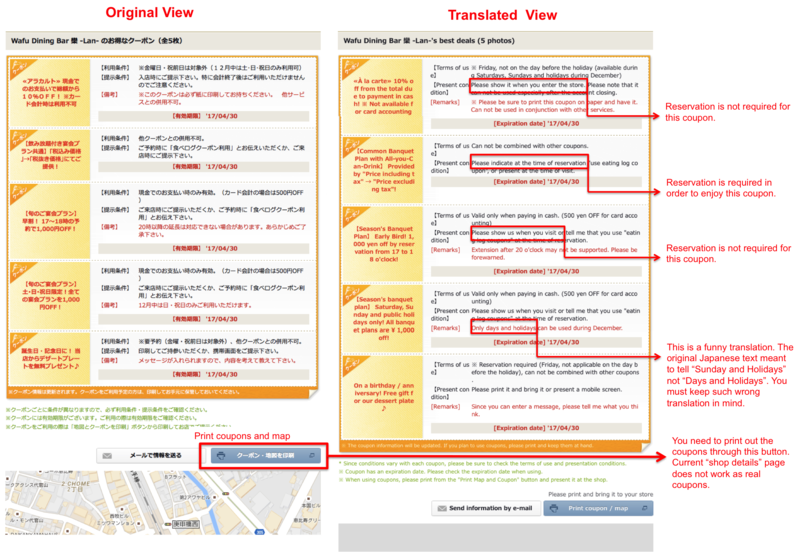 In some case, Google Translate Web still not able to show the translation in this page. If you come to that, it will be little more endurance but you need to open each review individual page and translate the page to page. 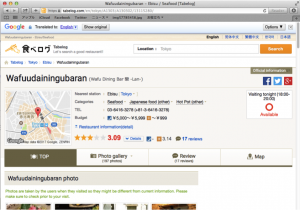 Thus you are able to see the locals’ reviews for restaurants. But please be careful, the web translation is not perfect thing. It is not only confusing sentences but surely leading you to have wrong translation some time. Especially for such reviews are some time written in spoken language, ( I mean very “colloquial”) Google Translate Web may not able to catch some idioms or dialects correctly. In any way, opinions from the real customers are very important, isn’t it? I hope checking reviews through Tabelog will be helpful for you. As well as Gurunavi and Hot Pepper Gourmet, this web site Tabelog also provides coupons from various restaurants. If you want to get those coupons, you need to dig in the Japanese page. For reservation on line, I am not guiding you here, because it is required to be signed up. By this reason, coupons which require reservation in advance are not target for me here. 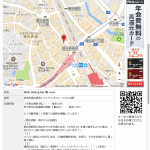 If you are the type who always need reserve a seat before visiting, please go look at Gurunavi Guide. 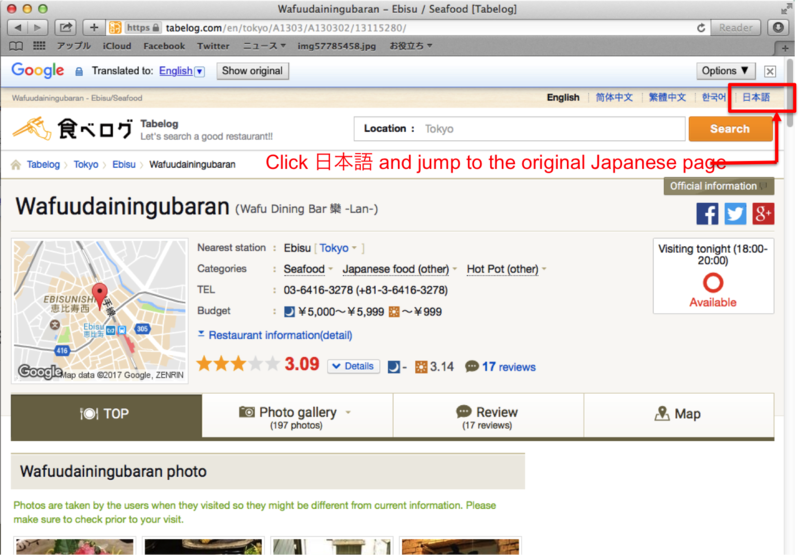 From the restaurant individual page, select 日本語 in the language option on top right. It will jump to the Japanese original page for the same restaurant. If this restaurant offers some coupons, you can find “Coupons & Map” tab on the right which is with red line on its top right corner. Japanese writing as in “クーポン・地図“. In order to see the coupons, you need Google Translate Web. 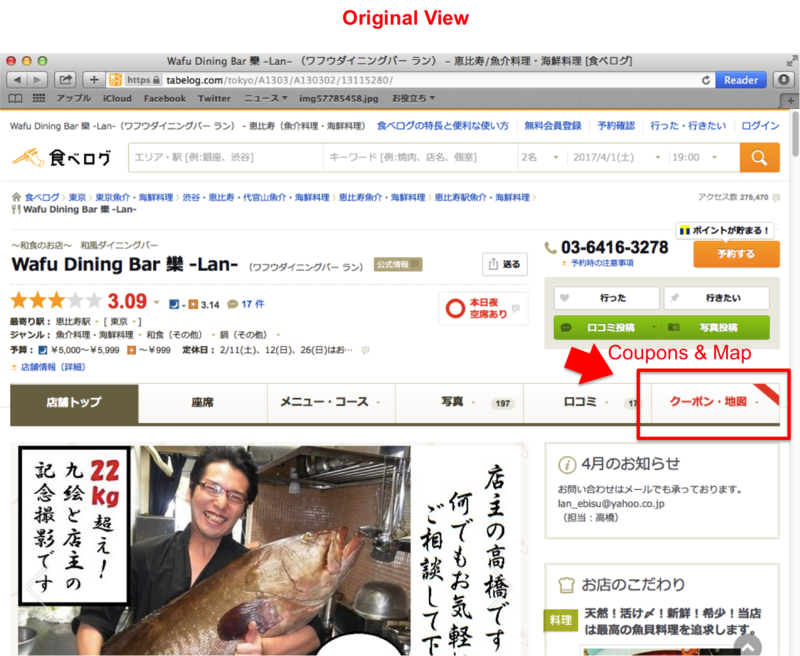 Copy the URL of the coupon tab page and translate the whole page. Good, you can choose a coupon you want to enjoy. It is normally not allowed to use more than one coupon at the same time nor combine with another beneficial deal. If you find a coupon that you can use, this view you are looking at is not the “coupon” unless print out through the print view. 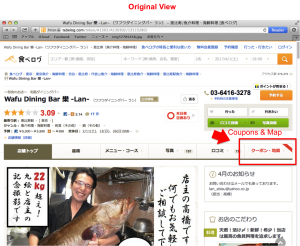 Scroll down the Japanese page and find ” クーポン・地図を印刷 ” button, which means “print coupons & map”. Pop’d up a small window with the coupons? Congratulations, print it out and bring to the restaurant. Please remember, what ever it is described, you are better off present the coupon to the staff before you order a meal. 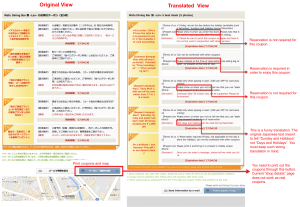 For the better practice, you better print out the English (or your language) translated ones, too, for your own reference. At least you need to point out in Japanese coupon which offer you are asking to. Alright then. Wishing you a happy dining, may it make your Japan trip perfect!